We’d love your help. Let us know what’s wrong with this preview of The Road to Freedom by Shawn Pollock. To ask other readers questions about The Road to Freedom, please sign up. The Road to Freedom is a World War II novel. It’s a really well written one by a debut author. Many of the World War II books I’ve read include a bit of romance to break up the hard things that happen in the story. This one doesn’t really. I did like the way the author had the characters do flashbacks to important times in their lives. I loved the way the reader gets a sense of what the character is like and why from these flashbacks. The main two characters in this one are Hans Kohler and Christ The Road to Freedom is a World War II novel. It’s a really well written one by a debut author. Many of the World War II books I’ve read include a bit of romance to break up the hard things that happen in the story. This one doesn’t really. I did like the way the author had the characters do flashbacks to important times in their lives. I loved the way the reader gets a sense of what the character is like and why from these flashbacks. The main two characters in this one are Hans Kohler and Christoph Meier. They have an interesting connection. Christoph is the captain of Hans’ army unit. He’s a man of the world. He’s been in Hitler’s Youth patrol and was very close to becoming an SS Officer. His family was not happy when he decided not to become an SS Officer. His father had known Adolf Hitler and was close to him. Hans is almost night and day different from Christoph. His family had been contacted by Mormon missionaries before the war. They joined the LDS Church and changed their lives all around for it. I loved the way he would pray and the answers to his prayers would always come. They always came in unusual and unexpected ways, but they always came. There are other characters in this book, but Hans and Christoph are the only two the reader comes to know well. As you can imagine, on the field of battle, there are a lot of the characters who just don’t make it. These two happen to, most likely because of Hans’ prayers in their behalf. The Road to Freedom shows a different side of World War II than you normally see. You see the point of view of a people who thought they were fighting for the right, when they were actually in the wrong. You see young men who were forced into a war that they should never have been forced into. And you see what happened to the men who were guards over the prison camps, both mentally and what happened when they were found. The plot of this one is full of action and danger. I liked the way it grabbed my interest from the very beginning and it didn’t let go. There was always another danger around the next corner. Anytime I thought the two main characters would be out of trouble, they just weren’t. And the ending is so well done! I loved this book. I started reading it on an airplane and I couldn't put it down. I finished reading it a few days later sitting next to the Berlin Wall at the Topography of Terror museum in Berlin. What kind of person would you be in war? How do you stay true to your beliefs when faced with tragedy and certain death? The Road to Freedom takes place at the end of World War II in Germany. The Russians and Americans are closing in on Berlin. The characters in the story have to decide how to survive I loved this book. I started reading it on an airplane and I couldn't put it down. I finished reading it a few days later sitting next to the Berlin Wall at the Topography of Terror museum in Berlin. The Road to Freedom takes place at the end of World War II in Germany. The Russians and Americans are closing in on Berlin. The characters in the story have to decide how to survive when the war is lost. They are faced with many challenges physically and emotionally. I really liked how each character was an archetype of a personality that you would naturally find in war. The consummate soldier, the farm boy turned soldier, the maniacal war-lover and the innocent bystander just to name a few. The interplay between these individuals striving against each other while at the same time desperately needing each other was great to read. I have read many historical fiction and historical non-fiction war novels. Both types of novels have to sacrifice either story or history. The Road to Freedom has both a great story and highlights an interesting part of history at the conclusion of a World War II in Germany. I highly recommend this book to anyone who wants to consider their place in history. How will you leave your mark on the world? Shawn Pollock, author of The Road to Freedom, has written an interesting and captivating story from the perspective of two German’s stuck behind enemy lines during the end of WWII. This story is not only intriguing because of the perspective it is written from, but also because one of the main characters is a Mormon. This story brings to life the struggle of men as they deal with trying to survive and protect themselves behind enemy lines. 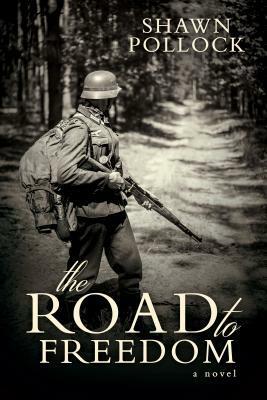 It is a tale of faith and war that will touch the heart Shawn Pollock, author of The Road to Freedom, has written an interesting and captivating story from the perspective of two German’s stuck behind enemy lines during the end of WWII. This story is not only intriguing because of the perspective it is written from, but also because one of the main characters is a Mormon. This story brings to life the struggle of men as they deal with trying to survive and protect themselves behind enemy lines. It is a tale of faith and war that will touch the heart of readers as they dive into this riveting story. The characters come to life from the pages as readers pursue this war-time novel. Readers will not want to miss reading this engaging and fascinating WWII story. A review copy of this book was provided by Cedar Fort. A review was not required and all views and opinions expressed are my own. A story about two men behind enemy lines and their struggle to survive--not just to survive but to escape. It has a ring of truth to it. It made me wonder if it were based on an actual event. It's solidly written and a good book by a first time author. Great action-packed LDS World War 2 novel about German soldiers trapped behind enemy lines at the end of the war.